We took a red-eye flight going to Korea because we want to make sure that we won't waste any time of our 4days vacation. Having a late-night flight then go straight for a full packed day tour when we reach Seoul, it was exhausting, to be honest. We got to Incheon airport early in the morning and we took the train to get to our hotel. Since it's still early to check-in, we just left our luggage at the hotel lobby without any decent sleep and started our day in Seoul by visiting the most famous temple in South Korea - the Gyeongbokgung Palace. Gyeongbokgung Palace which also means "A palace greatly blessed by heaven" is where the king lived. It was built during late 1300's and it is the main and grandest of all five palaces built by the Joseon dynasty. The Gyeongbokgung Palace is now considered to be one of the most popular tourist attractions in the city and a must-see if you are visiting South Korea. 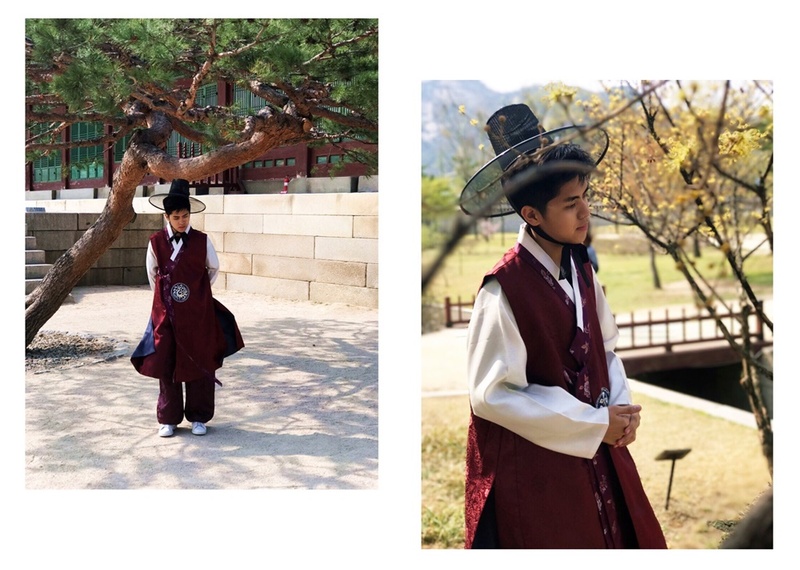 And if you're a K-drama fan like I am, the scenery here will remind you so much of the historical K-dramas: Love in the Moonlight, Moon Lovers: Scarlet Heart Ryeo, Hwarang and Ruler: Master of the Mask where the main setting of the story are in the palace and people around are wearing Hanbok. When we arrived in Gyeongbokgung Palace, we see quite a number of tourists and local girls who were in hanboks so we decided to rent as well from a shop near the place so aside from we could get a free admission to enter the palace, of course, we could have that authentic traditional experience too. Hanbok by the way is an example of a traditional Korean dress. It is specifically the clothing during the Joseon period and is worn as semi-formal or formal wear during traditional festivals and celebrations. Since we didn't spare much time in the Palace because we were really sleepy, tired and we still need to visit a long list of attractions in our itinerary, we didn't get the chance to explore the place. This is probably why my brother doesn't like to do itinerary, we tend to try/force everything on our list even though we can't barely appreciate the place anymore. Well, it's my fault for insisting my brother to make one. And aside from seeing the palace, you also must-see here the Korean traditional Royal Guard Changing Ceremony which happens on a scheduled time at the main gate of Gyeongbokgung. 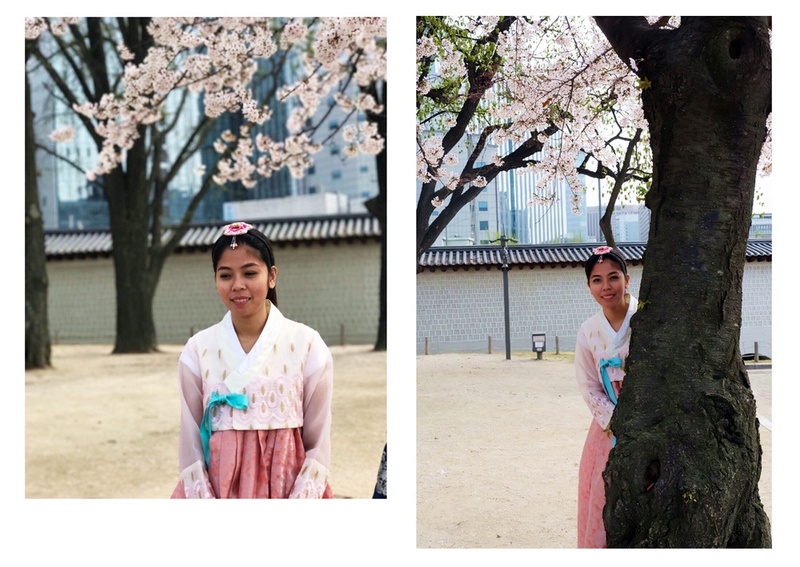 Unfortunately, we were too preoccupied and excited to take photos wearing our Hanboks and seeing cherry blossoms for the first time that we missed our chance to see the cultural ceremony and end up just taking photos and appreciating the beautiful scenery of the palace. Anyway, it is best if you know the schedule of the performances at the Palace. If you don't want to miss it yourself you better take note of this times of the ceremony so you won't make the same mistake we did. 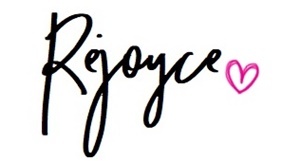 Someday! :) Push naten yan sa bato!